Malcolm Garrett is one of Britain’s best-known graphic designers, noted for his pioneering work in the arts and in interaction design. Collaborating with the likes of the Buzzcocks, Duran Duran, Peter Gabriel and the London Symphony Orchestra in music; Peter Greenaway, Jonathan Ross and Sam Taylor-Wood in film and TV; the Design Museum, the Science Museum and the Crafts Council in exhibition design; Michael Clark in stage production; Brian Eno, Peter Phillips, Denis Masi, and the Royal Academy in art publishing, Malcolm Garrett’s designs have offered cultural reference points for succeeding generations. In 2000, Malcolm was appointed a Royal Designer. He is a member of the Science Museum Advisory Board, and has recently joined the Misha Black Awards Committee. As creative director at 53K, he focuses on connected communications as a way of delivering brilliant and seamless communications design in all media, regardless of technology. Malcolm Garrett studied graphic design at Manchester Polytechnic in the mid 1970s, sharing a room with schoolfriend Peter Saville. 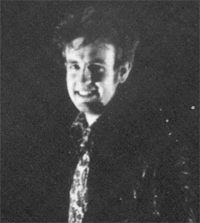 It was in his second year that he started designing sleeves for The Buzzcocks. His work was revolutionary on many fronts: it's strong abstract, colourful style; the graphical branding of an artist (the Buzzock logo being a formative example) and the use of all aspects of the sleeve in his design (even catalogue numbers became important and emphasized). Moving to London in 1978, he formed Assorted Images and worked in graphic identity, exhibition design, television graphics and literature design. Early work included Magazine, which may have introduced Jim to his work. He formally came on board and started working with the band for their Sons And Fascination album after they signed to Virgin. This heralded the start of a working relationship which would continue throughout the 1980s, with Malcolm creating many of the iconic designs which formed the groundwork for Simple Minds' strong graphic identity. With the exception of the Once Upon A Time campaign, Malcolm created the advertisements, posters, sleeves and tour memorabilia for the Sons And Fascination, New Gold Dream (81,82,83,84), Sparkle In The Rain, Live In The City Of Light and Street Fighting Years eras. His association with the band concluded in 1990 with the release of Verona and The Themes Volumes. 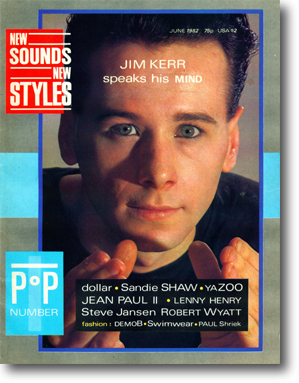 New Sounds New Styles , launched as a pop-music-and-style magazine in 1981, was designed by Malcolm. This issue caught Jim Kerr on the cusp of New Gold Dream and some of the artwork is reminiscent of the album's eventual design. He was also involved with the Touch Tape magazines of the early 1980s.